Do's and Don'ts – paper shredding service. Do’s and Don’ts – paper shredding service. When securely shredding your old paper data it is advisable to opt for a secure paper shredding service. Whether you are paper shredding Cork, Paper Shredding Galway or Paper shredding nationwide you should remember that a secure paper shredding service is best suited to save time, money and gives you peace of mind. Don’t be tricked into giving away confidential information. Don’t leave sensitive information lying around the office. Don’t release your data to a general waste vendor unless they have independent certified credentials for their paper shredding service. Make sure that it is only paper information that enters the paper shredding process, aerosol cans and batteries can cause a fire to occur during the paper shredding service and this is certainly something that you do not want to occur. Do not remove paper clips and staples from the paper, a professional paper shredding service can handle these small items. Do not always go with the cheapest option, Data Protection is such a serious topic today with fines of up to 20 million for data breaches, the cheapest service option may not have you compliant with the Law. In this case the risk cost associated with receiving the service far outweighs the savings you may make receiving the service. Go through your paper files to double check what you are shredding when hiring a paper shredding service. Make sure that the paper shredding service vendor is certified for the shred sizes No.3 up to No.6 of EN 15713. Shredding service providers can receive certification for EN 15713 but not including the shred size certification means that they may not be destroying the paper beyond reconstruction. 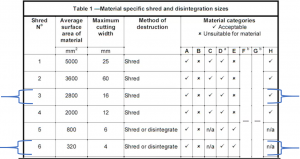 Please see table below detailing the shred sizes. Paper shredding and data security is and on-going effort for all businesses and private individuals today. Data is here to stay and that means that the threats associated with it are here to stay too. Stay safe and secure, the risk cost is well worth the effort for security. This entry was posted in Confidential Shredding, Data Destruction, Onsite Shredding, Paper Shredding, Uncategorized and tagged Confidential Shredding, confidential shredding Galway, paper shredding Cork by Security in Shredding. Bookmark the permalink.